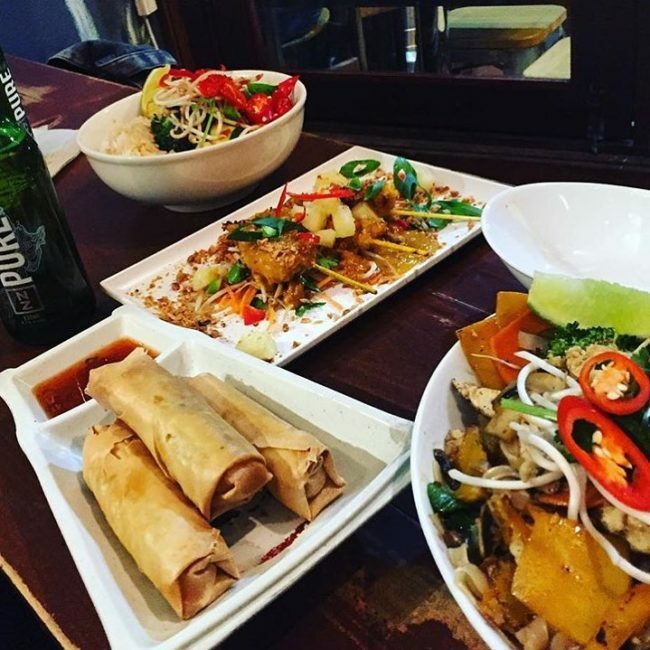 If you are a fan of Asian food then Byron Bay has plenty of eateries to tempt your tastebuds, from sushi, to spring rolls, you’ll want to check out this post. Start planning your next holiday to Byron Bay and put these Asian restaurants at the top of your list to try out. You won’t be disappointed! Osushi serves up fresh, contemporary Japanese food, including sushi trains, signature rolls and sashimi. The restaurant, which received a 2016 Savour award, uses only organic, local produce and MSG-free ingredients. It sits in the Woolworths Plaza along Jonson Street, and it is open 11:30am to 8:30pm everyday. Reviewers comment that it is outstanding, has “creative, tasty food” and excellent sushi. One person even said their group ate at Osushi four out of seven nights they stayed in Byron Bay! Asia Joe’s, 4 Bay Lane, features food inspired by street vendors throughout Asia. You’ll find stir fry bowls, curries, soups, salads and more. The BYO restaurant serves dinner everyday starting at 5 pm and lunch on Friday, Saturday and Sunday from noon to 3pm. Because of its location near the beach (although really many places are close to a beach in Byron Bay! ), it’s also a popular takeaway spot, especially for its noodle boxes. Open since 1997, Thai Lucy sits just off the beach and serves up a good variety of authentic food at reasonable prices. TripAdvisor reviewers say it’s easy to do takeaway here in case you want to head to the beach or take it on the way to your next activity. But if you’d like to sit and relax over your meal, reviewers say the waitstaff are good and the food comes out pretty quickly. Keep in mind, you can’t make reservations and Thai Lucy serves dinner from 4 t0 10 pm everyday. Red Ginger, with two locations – Byron Bay and Bangalow – functions as one part grocery store, part gift store and finally one part dumpling and tea house. It is a great place to stop in for a quick lunch. Dumplings are only $2 a piece, and steam buns are $2.70. Across the street on Jonson Street is Palace Cinemas so a TripAdvisor reviewer suggests stopping for a cheap meal of Yum Cha before going to a movie. Street Sushi, located on Jonson Street in Byron Bay’s city centre, is open everyday from 8 am to 4:30 pm, so stop in for a quick lunch while walking around. Or perhaps do a takeaway dinner and head down to the beach to enjoy your delicious meal. Specials, like the three rolls of your choice and a drink for $10, make this a cheap option to keep you on budget while you’re on holiday here in Byron Bay. You’ll also find a variety of juices and smoothies here as well. Kinoko is known for its changing specials, fresh sushi and sashimi. You’ll find share plates as well as main meals when you dine at Kinoko. Like the other restaurants, this contemporary style eatery is on Jonson Street and reservations can be made online or by calling the restaurant. It is open seven days a week. Some of the comments made by TripAdvisor reviewers said that Kinoko has great sushi, offered delicious choices for vegans, and had friendly staff. This new eatery in Byron Bay serves up the house special of Gua Bao buns filled with housemade sauces and meats, pickled vegetables, herbs and fresh vegetables. You’ll also find a variety of dumplings, soups and salads. Foxy Luu’s is located at 90 Jonson St. and is open for lunch seven days a week and dinner on Thursdays, Fridays and Saturdays. Grab a bottle at the shop next door and plan to lounge over dinner admiring the funky decor that includes the lighting that gives off a red glow from the red umbrellas covering the ceiling, the retro Japanese posters on the wall and murals. Come stay at Broken Head Holiday Park where you can find accommodation for any budget, and since you might be planning to try some (or even many!) of the restaurants listed above, then our cheap camping sites and beach shacks won’t break the bank. Our location has the best of both worlds, close to everything you want to do in Byron Bay, while still giving you the chance to relax in the quiet surroundings of Broken Head. Book your stay soon and fill your belly with some delicious Asian food!